Parents wanting to name their baby “Lindsay” may want to think twice, after E-Trade Financial found itself at the unintended comedic end of a $100M lawsuit brought about by the actress Lindsay Lohan who claims that the Super Bowl ad for the company defamed her. The story, appearing in the New York Post, is fairly stunning. Ms. Lohan, who just watched her fashion career with Ungaro sink faster than a submarine with screen doors, seems to think that she is in the same class of celebrity as “Oprah” or “Angelina,” when the truth is that her co-star Herbie is probably better known as a first-name actor. The suit was filed in a Nassau County (NY) court. No word yet as to whether terrorists have spiked the water in Nassau with hallucinogens or other narcotics that might explain what would prompt area lawyer Stephanie Ovadia filing this suit for Ms. Lohan. I guess if the cash is green and you can avoid openly laughing when someone with a first name shared by millions of other people comes and tells you that she wants damages for use of her uniqueness, you can file almost anything. Now I’ve seen this commercial a few times, and I cannot say with a straight face that I ever found any reason to suggest that it was riffing on Lindsay Lohan. 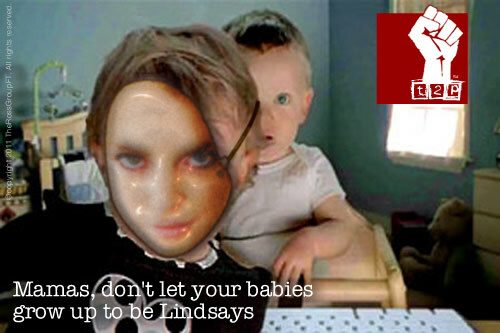 Perhaps if the male baby had said something like: “Lindsay? Oh you mean that skanky freckled-face bi-sexual baby and media ho?” Then maybe she might have a point. E*Trade should give her a million for the free publicity. What’s next? Lawyers recommending to y’all that everyone with a child named Lindsay should find a lawyer, develop a slog of class-action lawsuits, and sue E-Trade for defaming your daughter’s good name? Make sure, by the way, that you file a trade or service mark for your child’s name at birth, as Lindsay’s mom apparently has done. Lindsey Graham is thinking about filing a similar suit, as are Lindsay Wagner and Lindsay Price and Lindsay Hartley and Lindsey Vonn. I’m thinking, for my son, Holden, to compel the Salinger estate to recall every copy of “Catcher in the Rye,” and to demand that the name “Holden Caulfield” be replaced with “Iggy Caulfield” Let the guys named Iggy fight that one out. I can see the 15-minutes-of-fame thing as a selling point to the lawyer, but, unless there is some brilliant strategy on the part of Ms. Lohan’s agent and management in making her look like a complete fool and spend a week as the subject of jokes on the nighttime shows instead of pitching her upcoming projects on them, then I can’t see the win here. Even New York and LA area crack dealers are sitting back and shaking their heads at this one. Lindsays ain’t easy to love and they’re harder to hold. They give you a song-and-dance and demand diamonds and gold. And each night begins a new binge. Now it’ll probably make you cringe. Mamas, don’t let your babies grow up to be Lindsays. Let ’em be actresses and publicity-hounds and such. Mamas don’t let your babies grow up to be Lindsays. Little Gucci handbags and bad boys and girls of the night. Sometimes won’t know how to take her. Do things to make you think she’s right in the head. Let ’em do Kimmel and Ferguson and such. And sue someone for using the name. Ms. Lohan, you’re no Oprah. Leave your comedy career on the silver screen, and keep it out of the courtroom. This entry was posted on March 9, 2010 by Brian Ross in Celebrities, Entertainment, Lawsuits, The Law and tagged Angelina, Angelina Jolie, Comedy, Comedy News, E*Trade, E*Trade Lawsuit, Entertainment, Entertainment News, Funny, Herbie, Herbie The Love Bug, Hollywood, Humor, Law, Lawsuits, Lindsay Lohan, Lohan Sues E*Trade, Oprah, Oprah Winfrey.